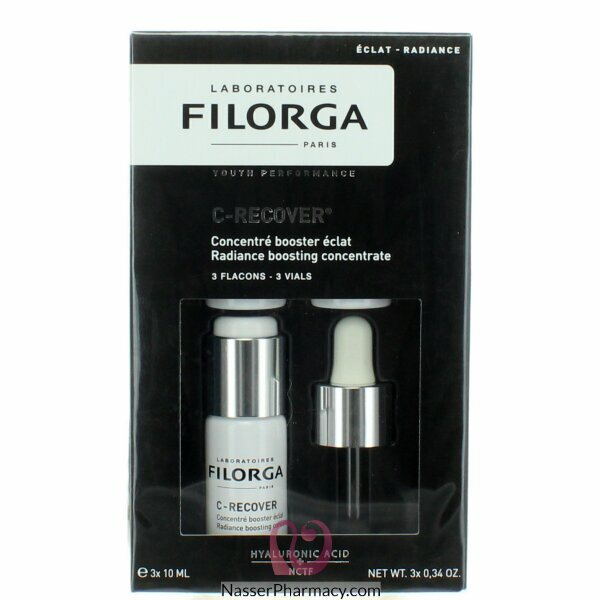 Filorga C Recover, the benefits of ultra-concentrated pure vitamin c (8%) are preserved intact until the time of use thanks to this air-tight and light-resistant packaging. A powerful antioxidant, vitamin C boosts collagen production and gives the skin radiance. Ultra- moisturizing polysaccharides and multi-revitalizing NCTF reinforce its anti-aging action. STAGE 1 - Activate by pressing hard on the white piston to release a dose of pure vitamin C powder. STAGE 2 - Shake vigorously then pull the piston again. STAGE 3 - Screw in the dropper. Press the rubber bulb to fill the dropper, and then unscrew it. STAGE 4 - Apply the product evenly across the skin every morning, before applying your usual day cream. During periods of exposure to strong sunlight, we recommend applying this product in the evening, before your night cream. The dose must be applied within seven days of opening. Store in a cool place after opening.